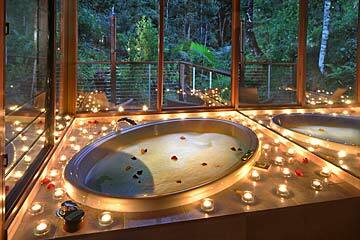 Couples Only accommodation (child-free) romantic weekends, romantic getaways and secluded escapes, QLD Gold Coast hinterland and NSW Northern Rivers. Luxury adults only retreats south of Brisbane in the Byron Bay, Kingscliff, Tweed Coast and Tamborine Mountain region. Australian romantic holidays. and Gold Coast hinterland, Tamborine Mountain area SE QLD, Australia. Offering places where the accomodation is suitable for, or caters to adults only, the accommodation below is ideal for romantic getaways, a romantic weekend, midweek getaway or just a much needed break from work or family pressures. 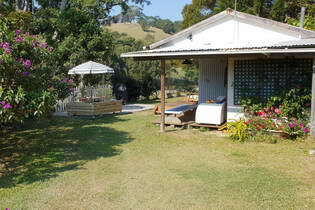 Some offer cabins or cottages, others are guesthouse style private suites. All are child-free adult retreat zones! Additional services such as meals, pampering treatments or activities, maybe available. The host or manager can generally be contacted onsite. Just 13 private, architect-designed luxury bungalows, all with fireplaces, double spa baths, and rainforest views, are placed discreetly in a spectacularly pristine Australian rainforest, less than 120 mins drive from Brisbane and just over 60 mins from Surfers Paradise and Byron Bay. From AUD $375 pn. to $655 pn. midweek, 2 night min. Situated amongst the peaceful surrounds of Belongil Beach, East On Byron is a 15-minute walk from the heart of Byron Bay. The landscaped gardens feature a lagoon-style pool and hot tub. Each of the 26 luxury villas at East On Byron are individually furnished with all the comforts of home, polished timber floors and open-plan living and dining areas. Featuring an on-site restaurant and an outdoor swimming pool, Hillcrest Mountain View Retreat is located in Crystal Creek, near Murwillumbah. Free WiFi access is available at this bed and breakfast. A patio with scenic views can be enjoyed from each guest room. This luxury adult only B&B offers free WiFi and magnificent views from the guest lounge balcony, which looks out to the Canungra Valley and the Great Dividing Range beyond. Each room features a claw foot bath or private spa bath. The Mouses House offers a choice of 12 chalets nestled within peaceful rainforest, with free Wi-Fi, full kitchen, fireplace and double spa bath. Facilities also include a hot tub, sauna, cold water plunge pool, and half-size tennis court. Located in the Gold Coast hinterland, and built on 50 acres, with 3 acres of gardens and forest, the 5-star Ruffles Lodge features a luxury day spa, an à la carte fine dining restaurant with beautiful coastal views, and a pool-side bar. Choose from private villas or executive residence style suites.